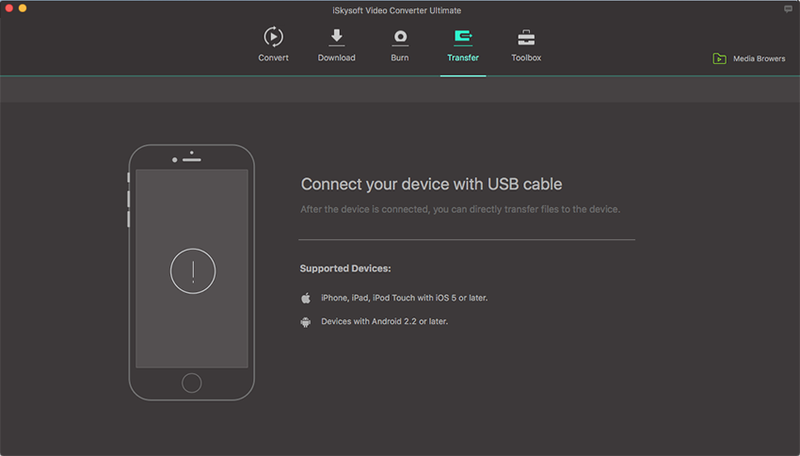 Apart from loading video files from Mac or Windows computer for converting, iSkysoft Video Converter Ultimate supports inputing video from iPhone, iPad, Android device and Sony camcorder with a USB cable connected. Convenient and time-saving! This video quality converter supports more than 150 output formats, including popular formats like MP4, HD MKV, AVI, FLV, M4A, WAV, AAC, etc. It also facilitates you to directly convert video to YouTube, Facebook or Vimeo supported formats. In addition, you are free to opt for the formats that your mobile phone supports, transferring and enjoying movies on your phone! iSkysoft Video Converter Ultimate also works as a video merger, helping you combine video files easily. Moreover, converting videos in batch becomes very simple with this HD video converter. Video formats AVI, MP4, MPG, MPEG, MKV, MOD, TOD, WMV, DV, ASF, RM, RMVB, M4V, TIVO, DPG, VOB, 3GP, 3G2, DAT, MOV, FLV, F4V, AP3, AIF, NUT, NSV, WebM, MTS, TS, M2TS, TOD, HD WMV, HD MKV, TP, TRP, HD MOD, HD MOV, HD FLV, Youtube Video, Vimeo, VEVO, Facebook Video, FLV, SWF, F4V, etc. DVD DVD disc, DVD ISO file, DVD folders, DVD IFO file. Devices iPhone, iPad, Apple TV, HTC, LG, Samsung, PSP, Xbox, Samsung Gear VR, HTC Vive, Oculus Rift, etc. As an ultimate leading video file converter, iSkysoft Video Converter Ultimate guarantees the lossless conversion. It keeps the original video or audio quality by default, unless you change the output settings or compress videos. To activate "High Speed Conversion", you can easily click on the "Lightning" icon on the left bottom corner of the main interface. Note: You're only supposed to download the videos with authorized copyrights. iSkysoft Video Converter Ultimate is not only a video converter, it also makes video editing easy with its built-in video editor. With it, you can trim, crop, rotate video, and then convert the video to other formats if needed. What’s more, you can also add subtitles, watermarks, metadata info and special effects to the video simply. Customize your DVD videos with free templates inspired by romantic, holiday, ocean, etc. After loading the video, you can easily burn it to multiple DVD discs without reloading. 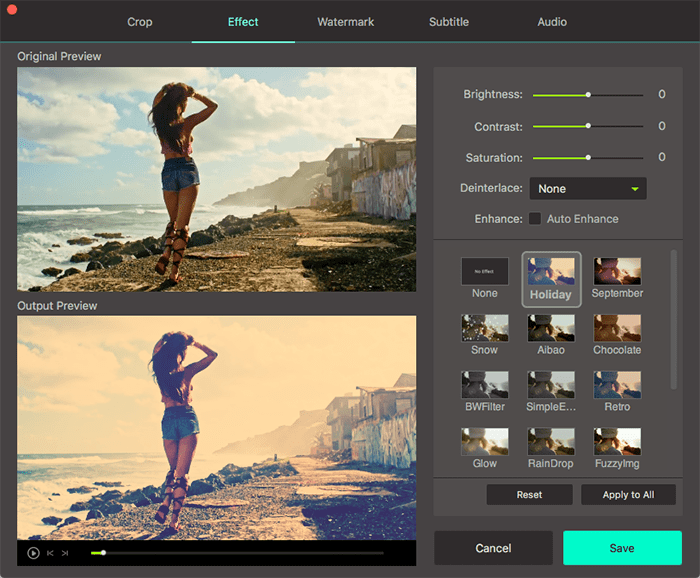 Trim, crop, rotate or add watermark and subtitles before burning DVD, even one click enhance with preset effects. Backup your DVD video to your Mac or Windows PC in case of damage and loss to keep your precious memory. This one-stop HD video converter provides you the easiest way to transfer the converted video or audio files to your mobile devices, including the newly iPhone XS (Max), iPhone XR, iPhone X, iPad, iPod, Samsung and other Android phones, tablets and external hard drives. Just have a try and enjoy your videos whenever you want! iSkysoft Video Converter Ultimate must be the best video converter for Mac and Windows users. For better experience, you can take full advantage of these handy & useful tools for your convenience! More features will be incorporated along with the updates of this Windows & Mac video converter. Convert Video: To convert video, you can import video to iSkysoft Video Converter Ultimate first. Then choose the output format and folder. After that, click “Convert” to convert video in seconds. Download Video: Two ways to download video: You can paste video URL after clicking the “Add URL” button on the menu; or hit the “Record” button while playing streaming video in browser. Burn Video: Go to the “Burn” tab, and then load your video to the software. After that, give a name and choose a menu to your DVD disc. Hit the “Burn” button to start burn DVD file with this DVD burner. Edit Video: After importing your video, hit the “Edit” icon on the menu. You will get an editing window soon. Now you can trim, crop, add subtitles/watermarks/effects to your video at will. Transfer Video: Connect your device to the program via USB cable. Then you can easily transfer the converted videos to iPhone, iPad, Android phones with one click. 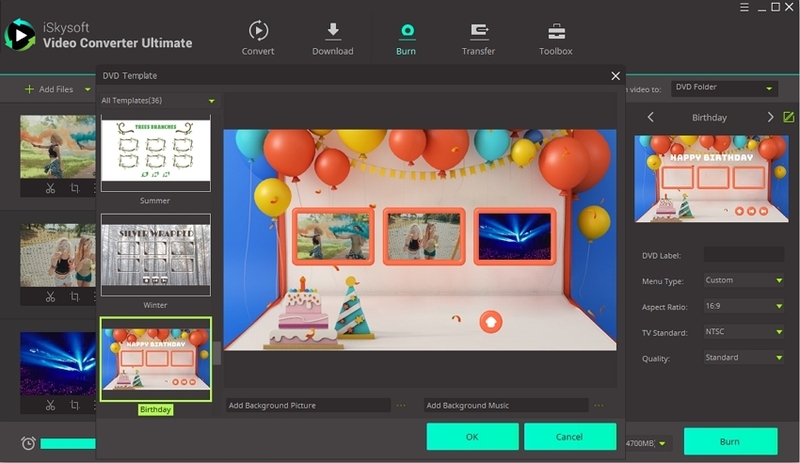 Toolbox: In the toolbox, you can get useful tools to edit metadata info of your videos, convert VR videos, record screen, convert videos/photos to GIF and copy DVD. Rounding out the award-winning products in our review of the best Mac video converters is Media Converter by iSkysoft Studio.This video converter for Mac stands head and shoulders above most of the competition, earning the Top Ten Reviews Bronze Award. iSkysoft Video Converter Ultimate is the best HD video converter for both Mac and Windows. You can use it to convert MP4, MOV, VOB, AVI, MKV, MP3 and many other formats. Find the useful tips for how to convert video here. How Can I Watch MP4 Movies on Mac?